I would like to welcome Jennifer Iserloh -The Skinny Chef – who is here today doing a special post for us on making healthy leftovers from your holiday feast! As a professional chef and certified yoga teacher, Jen has been sharing her philosophy on healthy cooking and living for many years, through more than 500 articles, videos and podcasts. 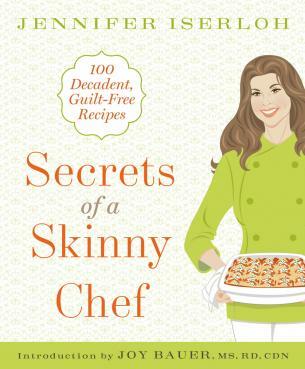 Jen’s new book, “Secrets of a Skinny Chef” is sure to make this upcoming holiday season a healthy one! Thanks, Jen, for stopping by and sharing some of your healthy secrets! After a full day of kitchen toiling and noshing, it’s handy to have leftovers that you can rely on for quick meals. So, I’d like to give you some tempting meal solutions that will not only draw out the holiday cheer, but could very well re-invent the way you look at turkey day leftovers. These three different meals come together quickly and are really tasty! This is so much more creative than just re-heating the same old leftovers. Who knows, maybe you’ll even start some new family traditions! 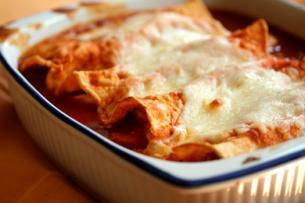 Turkey enchiladas are a great way to use up leftover turkey. You would never know that there is both spinach and broccoli added to this one-pot meal! This meal is a huge hit with kids as well as grown-ups! You can make these enchiladas ahead of time. Just be sure to cover the casserole with plastic wrap and pop it into the fridge until you are ready to bake it. Mix together 1 cup of chopped, cooked turkey with 2 cups of baby spinach or one cup of finely chopped broccoli florets. Stir in one cup of jarred salsa. Fill eight small whole-wheat or whole-grain tortillas with the turkey mixture. Place the filled tortillas, seam-side down, in an 8 x 12-inch baking dish. Top the enchiladas with your favorite canned enchilada sauce and then sprinkle on 2 cups of pre-shredded part-skim mozzarella on top. Bake for about 20 to 25 minutes in a 350°F oven until the cheese is melted and has lightly browned. Don’t toss out that last scoop of savory mashed potatoes! 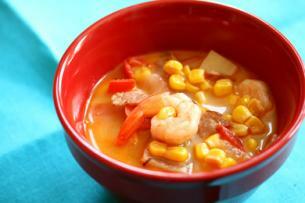 Make a fast, hearty, shrimp and corn chowder soup by relying on staples that reside in your freezer and pantry. I always have a frozen bag of cooked shrimp on hand as well as a bag of frozen mixed vegetables. Simply heat a large stockpot over high heat and add a tablespoon of olive oil. Cook one half of a chopped onion with two slices of chopped bacon or ham. Cook until soft but not brown (about 4 to 5 minutes). Add in a few cups of frozen veggies from your freezer, a cup of frozen shrimp, and two 15-ounce cans of low-sodium chicken broth. Simmer on low, (about 10 minutes) until the veggies and shrimp are soft, and then stir in your mashed potatoes and serve immediately. If you made a Broccoli Cheese Casserole, you can enjoy all the flavor off the leftovers without all those calories by dividing up the leftovers and making some egg burritos. Be sure to use whole wheat wraps, which are an easy way to add more whole grains to your diet and their soft texture makes them kid-friendly as well! Coat a medium sized skillet with cooking spray and place it over medium heat. Add the eggs and cook 1 to 2 minutes stirring once or twice. Add the warm broccoli casserole and cook for 1more minute. Divide the egg mixture between two large whole wheat flour tortillas that have been warmed in the microwave for 10 seconds. Serve immediately. 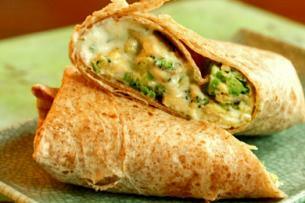 Everyone loves this protein-rich breakfast burrito that also has the rich flavor of broccoli cheese casserole! Looking for the secret to eating filling comfort meals the fast and healthy way? Check out more recipes and tips on my web site or in my latest cookbook! You can also discover how you can ditch the diets, enjoy life more and eat the food you love.